CLEAR PLASTIC DESK BUTTONS are the perfect plastic spacer between glass and tables. This includes tables, pedestals, and other furniture tops. These plastic desk buttons control the movement of the glass on many types of surfaces including wood, metal, and plastic. 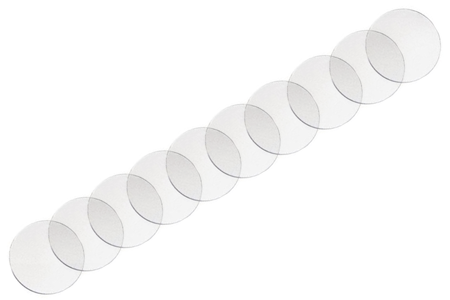 These plastic discs are the ideal cushions for leveling your glass table top and so that it doesn’t move as easily. It also protects the underneath side of the glass from being scratched by the table. They are not adhesive, so they can be easily adjusted or removed, and appear nearly invisible underneath the glass. Provides enough desk buttons for two glass table tops.